Love is everything. Really. We think that. Thank you for coming to another one of these! The great thing about this newsletter is we send it out rarely and I (inappropriately) feel that gives me license to talk about more than jewelry. 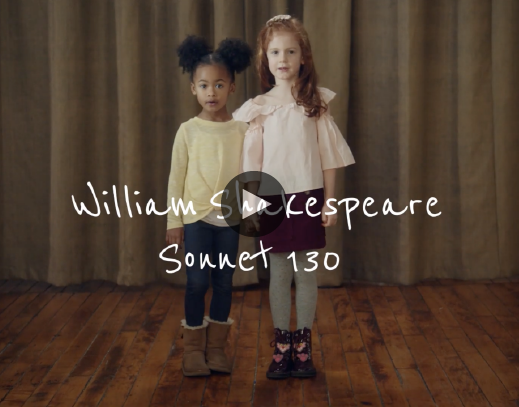 We made a little video of children reciting Shakespeare's Sonnet 130 without any practice—as they hear it for the first time. It's the one that scoffs at beauty—"My mistress' eyes are nothing like the sun"—and in doing so gets to the very heart of love. We put it on our website and our vending machine which we are thrilled to tell you is now installed at the MZ Wallace boutique in Soho. After two initial stints in Brooklyn, our vending machine has finally made it to New York City! Monica Zwirner and Lucy Wallace. Our machine will be there until February 24 and has a beautiful selection of pieces that Lucy and Monica helped me choose (they are customers too so they know their way around our jewelry). You should come see it. And in fact you should come on February 12 when the MZ Wallace team will throw an event to celebrate our collaboration at the store. It's located at 93 Crosby Street (between Prince and Spring St.) in SOHO, NYC from 5-7PM. I'll be there of course. I may never leave actually. And if of course you are not nearby and want to buy what's in our vending machine, you can shop here or visit one of our wonderful stores. As ever, please come share your thoughts and opinions with me on Instagram—I can't seem to help myself so the more the merrier. Marla Aaron Jewelry, All rights reserved.